Non-flour dipped fried chicken is the new trend of fried chicken in Jakarta. 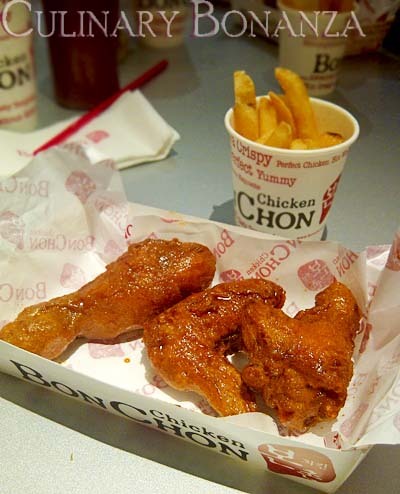 Bon Chon Chicken, a chicken restaurant chain from South Korea has set foot in Jakarta. What a good news for culinary enthusiasts here, because just for your information, so far Bon Chon can only be found in a few other countries like the US, Thailand & the Philippines. To be very honest, if I previously always took the trouble to peel the greasy skin off any fried chicken I ate, the exception only applies to Bon Chon. There are a few strong reasons for doing so. 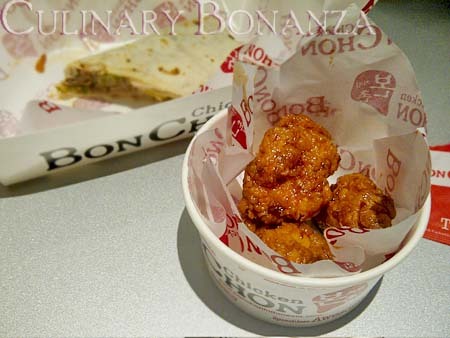 Firstly, Bon Chon uses free range chicken that are selected by weigh. So to spoil the fun (for some of us) no grease-dripping chicken will be served here. Besides that, the skin is also the best part of the Bon Chon experience. The chicken pieces are marinated in the special sweet and savoury sauce, which is why the crunchy skin is the highlight of your feast. 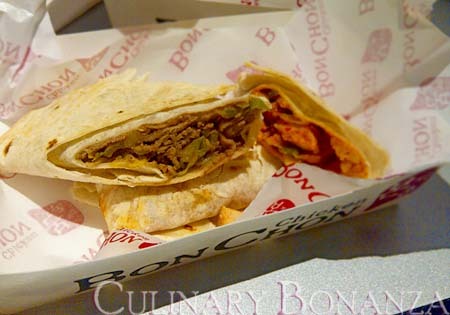 Bon Chon recently launched its new addition to the menu they are the Bon Chon Wraps: Chicken Wrap (caution, very spicy) and Bulgogi Wrap (with juicy beef slices inside). I have two personal favourite items here. The first one is the the Bon Chon Bites, which are bite-size boneless chicken with crispy skin & marinated in the special sauce. The other champion is the ice-cream filled Mochi. It is as if the snow skin melts in your mouth as you sink your teeth in and taste the delicious ice cream. I wished I could have more...haha, maybe not at this food tasting, but I don't mind paying for these yummy bite-sized sweet treats. will definitely try when I'm back. itu ice creamnya rasa apa? all far below my standards..